We asked six nail techs to show us how to create glitzy, eye-catching nail designs to impress at every holiday party. 1. Apply two coats of gold gel-polish and cure. 2. Using hard gel, gem gel, or nail glue, attach 3-D studs in your desired pattern. Cure or let dry. 3. Repeat step two, adding gold bullion as accents around the existing pattern. Apply top coat and cure. 1. Apply two coats of a black gel-polish and cure. Apply gold glitter to the top half of the nail by sticking it onto the dispersion layer and fading it as you move downward. 2. Apply silver glitter to the rest of the nail, fading upward towards the cuticle. 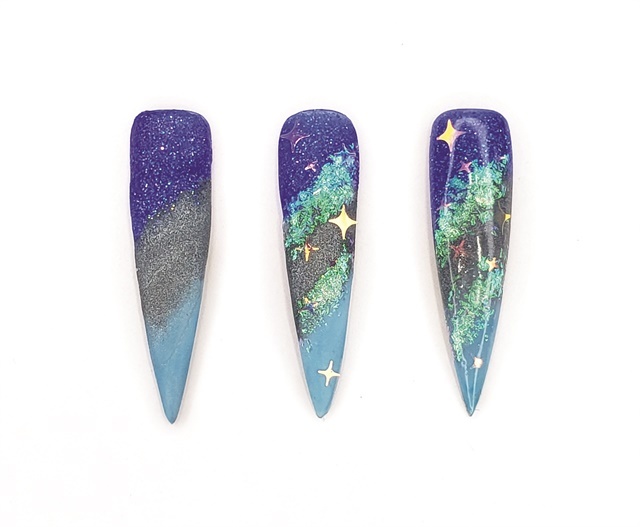 Use a fan brush to remove any excess glitter from the nail plate. 3. Use a black art gel and a long striper brush to apply the geometric patterns. Cure. Apply top coat and cure. 1. Apply two layers of CND Shellac Luxe in Black Pool. Cure each layer. Apply one layer of CND Shellac Luxe Top Coat. Cure. 2. Mix a drop of CND Shellac Luxe Top Coat with gold glitter. Use a stylus to apply dots of the mixture in random sizes. Cure. 3. Mix a drop of CND Shellac Luxe Top Coat with silver glitter. Use a stylus to apply dots of the mixture in random sizes. Cure. Remove the sticky top film with 99% isopropyl alcohol. 1. Apply two layers of CND Shellac in Emerald Lights. Cure each layer. 2. Apply one layer of CND Shellac Matte Top Coat. Cure. Remove sticky layer with 99% isopropyl alcohol. 3. Use a detail brush to apply Wildflowers Spider Gel in a random pattern across the nail. Do not cure. Sprinkle silver glitter on uncured Spider Gel. Let sit for 30 seconds. Cure. 1. Apply two coats of Kokoist E-3 Rouge Red. 2. Using Kokoist E-1 Maxi White, apply two thick stripes diagonally across the nail. A good tip is to pull your gel across instead of trying to draw it on. 3. Add some thinner stripes to fill in the nail. Flash cure in between each stripe to lock in the parts you’re happy with. Apply Kokoist Non-Wipe Top Coat and cure. Add two thin green stripes with Kokoist E-14 Green Pepper over the thick white ones. Do not cure. Sprinkle Kokoist Mermaid Dust over the top of the wet stripes and cure. Dust off the excess powder. 1. Start with two coats of Kokoist E-2 Maxi Black or one coat of E-148 Blackest Black. 2. Using Kokoist E-84 Platinum Micro Glitter, create a smaller firework in the upper corner and add some dots to fill in the empty space around it. 3. Top coat the nail with Kokoist No-Wipe Top and cure. Add one more firework but this time leave it wet. Sprinkle some Kokoist Mermaid Powder Dust over the top of the wet stripes and cure. Dust off the excess powder. Using Crystals for Nails Gem Gel, apply two small dots of gel on the inside of the fireworks and place two small black Swarovski Crystals. Cure. 1. Apply two coats of CND Shellac in Cream Puff and cure. Top coat with Wildflowers chrome top coat, cure, and apply hologram chrome. Apply Wildflowers chrome top coat again and cure. 2. Lightly buff the shine from the nail and wipe clean. Using CND Shellac in Black Pool and a line brush, draw lines that will become swirls and cure. Use a thin art brush and gel top coat to draw more swirls. Do not cure. Sprinkle with loose red glitter. Arrange the red glitter into the exact shape you desire, then cure. Add in some green accents using LeChat Perfect Match Gel-Polish in Anonymity, and cure. 3. Finish up with a coat of CND Shellac Duraforce Top Coat. Do not cure. Sprinkle with Swarovski Crystalpixies and cure. Finish by adding larger Swarovski crystals in a cluster, using builder gel to adhere them. 1. Begin with two coats of CND Shellac in Oxblood, curing after each coat, then top with CND Shellac Matte Top Coat and cure. Wipe clean. 2. Using a thin brush and Akzéntz Gel Play Glitter in Golden Nugget, paint a cuff line at the cuticle, a thin “X” pattern in the middle, and an outline at the bottom of the nail. Cure. Use the same thin brush to apply CND Duraforce Top Coat on the gold areas only, cure, and wipe the tacky layer off. 3. 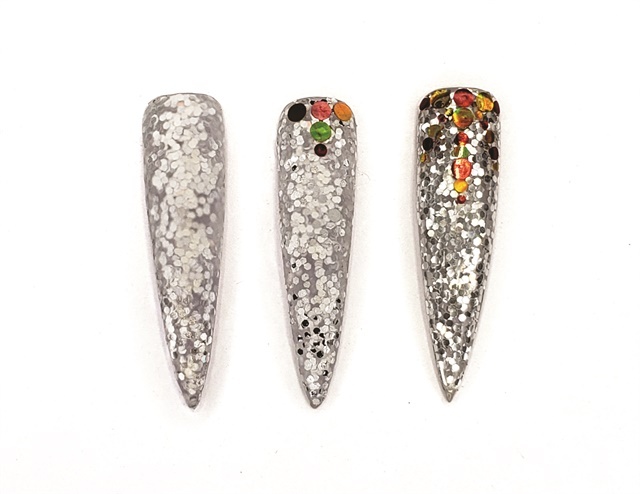 Using your preferred method to adhere crystals, arrange Swarovski crystals on the middle of the nail. Add some loose glitter on the sides by filling the area with CND Shellac Duraforce Top Coat. Do not cure, add loose glitter, lightly pat down, then cure. Finally, top with more gel top coat over the glitter only, cure, and wipe clean. 1. Apply silver, glittery deep blue, and shimmery white acrylic to the nail at an angle, melting each color into the last as you go down the tip. 2. Add opal glitter flakes running along where each color meets. Add several glitter stars to the nail in different sizes. 3. Cap with clear acrylic and shape. Clean and apply gel top coat. 1. Use acrylic to apply a chunky light silver glitter to the entire nail. Shape and clean excess dust. 2. Apply top coat and add gold and red circular-shaped glitter in a pattern at the top of the nail. 3. Finish with a shiny gel top coat. 1. Apply two layers of white gel-polish and cure. 2. Paint a thin layer of tack-free top coat and use a stylus to begin picking up your preferred color of glitter for your present. Place the glitter in the outline first, then cure. I used Wildflowers Metallic Top Coat and holo glitter stacks. 3. Repeat step two, but begin to fill in your present and add the gold glitter lines. Cure and apply top coat over the whole design. 1. Apply two layers of black gel-polish and cure. 2. Use Rose Gold Leaf from Akzéntz to paint the middle stripe and cure. Then add the 2019 using Akzéntz Gel Play in Black and cure. 3. Wipe off any tacky layer. Using Wildflowers tack-free top coat, paint on either side of the rose gold. Before curing, pour Swarovski Crystalpixies in Rock Shock into the top coat and push the crystals around until you’re happy. Cure, add a layer of top coat to your middle stripe, and cure again.